ML Finally Likes Elephant & Piggie Books | What is ML Reading? 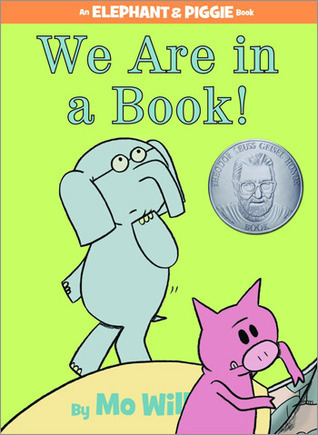 I’ve checked out Elephant & Piggie books by Mo Willems for years. ML emphatically refused for us to read them stating, “You know I don’t like comic books.” Recently she said, “Mommy, I don’t like the Pigeon books anymore. I like the Elephant & Piggie books.” The Pigeon books are by Mo Willems too. The library received a new pigeon book days before this conversation. I responded, “OK, I won’t bring home the new Pigeon book, The Pigeon Needs a Bath. ML changed her tune requesting, “Please bring home the Pigeon book, but also bring home some Elephant & Piggie books.” Excitedly, I seized the opportunity and requested every Elephant & Piggie book published. The night I brought home The Pigeon Needs a Bath bedtime snuck up on us. I wanted to multitask the bedtime routine by reading to ML while she ate her bedtime snack. Sitting on the floor in the kitchen, I was ready to begin reading. ML said, “Wait! I want to read The Pigeon Needs a Bath to you.” On our dusty wooden floor, I realized something. The only people who read picture books out loud with more feeling than a children’s librarian are the children of these librarians. I’m glad I didn’t force the Elephant & Piggie books on ML. The dramatic opportunities in these books are beyond measure. Of course, I didn’t realize this until ML showed me. She decided I should be Elephant and she would be Piggie. We’ve been reading them out loud together. Recently, her friend came for dinner. They acted out seven different Elephant & Piggie books. I sat on the sofa and held the books open so they could read the words. It was fun watching them taking turns being Elephant & Piggie. There were even costumes made from blue painter’s tape. A long strip taped to Elephant’s nose and a short curly tail for Piggie allowing for quick costume changes after each book. My wonderful friend from library school who lives in California posted Elephant & Piggie Do Reader’s Theater last week on her blog. Looks like children from coast to coast are performing dramatic readings of Elephant & Piggie books. When you read the Elephant & Piggie books (because you must no matter your age or access to children) make sure to check out the back inside covers of the books. The Pigeon makes an appearance. I’m not buying ML’s comment, ” I don’t like the Pigeon books anymore.” She loves finding that silly bird hiding out in the Elephant & Piggie books. 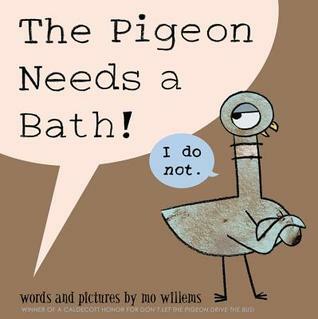 This entry was posted in Easy Reader and tagged Elephant & Piggie, Mo Willems, The Pigeon Needs a Bath by mlreads. Bookmark the permalink. We also love reading these together by each choosing a character. Some of the ones we own even the four year old will get in on the action of “reading” because she knows them so well! So cute, I love your togetherness time and the way you relate it to others. A great example for all families! Pingback: Future Librarian in Training and A Secret | What is ML Reading?